Philocrites: Coming to you live, from Nauvoo, Illinois. Coming to you live, from Nauvoo, Illinois. A quick hello from Nauvoo, the town on the Mississippi River that the Mormons founded and then abandoned when their leader, Joseph Smith, was murdered back in the 1840s. And what on earth is Philocrites doing in Nauvoo? 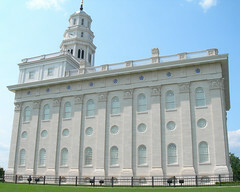 My sister, who lives in Chicago, is getting married this morning in the rebuilt Mormon temple. And since I'm in Illinois this weekend, now would be a great time to mention that I've been too busy to post anything about Sen. Barack Obama's landmark speech to Call to Renewal last week, but I know you're itching to talk about it. Previous: Tom Stites on the future of journalism. Next: This week at uuworld.org: Love from the start. "And by the way, we need Christians on Capitol Hill, Jews on Capitol Hill and Muslims on Capitol Hill talking about the estate tax." Buddhists, Hindus, Native Americans, Pagans, and other faiths that aren't Abrahamic need not apply. If this is the language of the Jim Wallis "religious left" in 2006 then count me out (they already did). At least Michael Lerner lets us participate in his conferences. Bitter truth alert: Senators do not go around trumpeting neo-paganism -- or any other new religious movement -- in any speech directed at the broad center of American public life. Is this a surprise? And do you think that Americans who practice non-Abrahamic faiths are more excluded from public life by Obama's approach than by secularist approaches or conservative approaches? By counting yourself out of the "religious left," are you aligning with some contrary faction? Will the "spiritual progressives" hold Obama's feet to the fire until he recants? Will they vote instead with anti-religious factions on the left? Will they opt out of Democratic politics? What does counting yourself out involve, exactly? Do other Unitarian Universalists feel themselves excluded from Obama's speech? If so, why? What religious approaches to political discourse do you think can succeed in contemporary America while moving things in a progressive direction? I'm just a little sick of constantly having to swallow the "bitter truth", evenutally, I'm hoping I can expect something better from our leaders. I'm not expecting politicians to embrace Pagans, I'm not hopelessly naive. But there are large and growing populations of religious believers in the country that aren't abrahamic, and once in a while I wouldn't mind it acknowledged (at least in passing). I just know that if we continue only with "what works now" we will never get to "what will work for everyone". That is what I'm saying. "And do you think that Americans who practice non-Abrahamic faiths are more excluded from public life by Obama's approach than by secularist approaches or conservative approaches?" On the surface? Maybe not. But language matters. Secular politics may not give minority faiths inclusive language either, but at least they (in theory) don't raise one faith over another. I've been a part of the "spiritual progressive" dialogue online for awhile now and I've seen the non-Abrahamics being (politely) pushed aside in order to "win elections" in 2006 and 2008. It is very much like the closeted gay organizer (Bayard Rustin) of MLK's march on Washington. The world wasn't ready for that much freedom. It remained "unready" until gays decided they had enough waiting. So for now, fine, talk Abrahamic-only to win elections. It is the pragmatic thing to do, but it isn't the spirit-lead thing to do in my humble opinion. And gays organized, putting cash and shoe leather into the mix. That organizing started in the 1950s, and has included a constituency of millions. It only started paying off in the last ten years or so, and then only irregularly. Religious freedom is a right, but political pull is earned. Earned and not bestowed. ...and some would argue too many Senators way too fond of Bacchus. "Religious freedom is a right, but political pull is earned. Earned and not bestowed." That would be fine if I was only talking about "political pull", but I'm also talking about people who claim to be building a "religious left" or a "religious progressive" movement. I'm not saying that Jim Wallis (or Lerner, or anyone else) has to give Starhawk a big hug in front of reporters. I'm simply saying that non-Abrahamic faiths are being (intentionally) left out (and I didn't mean only Pagans, I'm talking the full spectrum here). So, please let me know how much bootstrap-pulling is necessary before these coalitions move beyond tolerating us showing up to their meetings and actually acknowledge we exist. I thought that if any denomination could provide leadership on the issue of embracing theologies outside of Abrahamic monotheism it could be the UUs. Finally, to talk specifically about modern Paganism, we have been organizing and pushing for respect and fair treatment for decades now. Great strides have been made (in some areas), Pagan groups are included in the Parliment of World Religions, we have been able to fight for inclusion in local inter-faith groups, some major court-cases have been won, and we have more Pagan-run charities now than ever before. Pagan groups are part of the grass-roots efforts to keep gay marriage legal in Mass. But to most Christian groups we are bad for press, and bad for winning over those evangelical swing-voters so that "political pull" will most likely never be seen in my lifetime. Heck, I doubt I'll see a Hindu or Buddhist congressman in my lifetime. There has to come a point where those groups in power have to meet those on the outside halfway. The "Christian Left" as typified by activists like Wallis (and Obama, as much as I like him) don't seem to be there yet. I just want to quickly apologise to Philocrites for gettin' all verbose on this blog post. This is just a sore point for me at the moment, even more sore after attending a faith-based organizing meeting at the Midwest Social Forum this afternoon. No doubt I'll write more about it on my blog. I hear what Jason is saying, but I read Obama's speech as a speech. It's not a position paper and therefore doesn't need to include laundry lists of all the people Obama would bring to the table were he running the show. It's a speech, which means it must be full of shocking, exciting, thrilling "zing" factor moments that will work as a *zing* FOR THE TYPICAL AMERICAN. The typical American isn't thinking one iota about a Hindu or a Buddhist or even a Muslim on Capitol Hill. It's just not on their radar. Is it not wise to assume that once folks start imagining this nation as *other than just exclusively Christian* we might open the door a crack to acknowledge the presence of other groups, such as pagans? Now is not the time for Barak Obama to do this. Now is the time to make *zing* statements that make people excited, not that make them scratch their heads and go, "Huh? I never heard of THOSE before." Personally, when I hear "Jew and Muslim" I don't hear "only Abrahamic faiths need apply." I hear, "Hello, you Christian theocratic schmucks, we live in a religiously diverse nation." And yes, I feel included as a Unitarian Universalist. I listened to the speech but did not read it -- if my memory is correct, though he just included Abrhamic faiths in one place, I think he did mention Buddhism and Hinduism somewhere else? Or am I misremembering? Buddhist Congressman Bob Matsui represented Sacramento; he died in 2005. He's the only I can think of. I bet there have been others. Hawaii is not exactly a hotbed of European Abrahamic-ness. Oh, this is cool, more non-Abrahamic Congressfolk. Dalip Singh Saund, a Sikh (though some folks, perhaps because he was born in India, erroneously believed he was a Hindu) was elected 50 (that's 50, the big 5-0, so that is possibly outside of Jason's lifetime) from California's 29th Congressional District, representing the (hardly progressive) counties of Riverside and Imperial. It's so UU to whine before even knowing the facts to whine about first. "Whine first, ask questions later." Is that one of the Seven Principles? If it's not, I'm certain one of the Seven Principles is "Search for victimhood and exclusion everywhere, above all your own." I'm sorry, I messed that up. I mean Dalip Singh Saund was elected to Congress 50 years ago, in 1956. In Obama's excellent speech, he talks about feeling chagrined for getting caught up in the hurtful rhetoric of the pro-life/pro-choice debate, and subsequently committing himself to fair-minded, respectful speech. Richard, when you characterize Jason's posting as whining, it sounds to me like disrespect. I think it's possible to heatedly disagree while maintaining respect for one another. As a matter of fact, that kind of generous respect is what I think of as "so UU." You're right, I don't have much respect for uninformed criticism, Jake. Should I? I thought ours was a rational faith. Jason Pitzl-Waters mentions one part of Sen. Obama's speech at the Call to Renewal conference where he mentions Christians, Jews, and Muslims, and interprets this as an indication that "other faiths that aren't Abrahamic need not apply." "Moreover, given the increasing diversity of America's population, the dangers of sectarianism have never been greater. Whatever we once were, we are no longer just a Christian nation; we are also a Jewish nation, a Muslim nation, a Buddhist nation, a Hindu nation, and a nation of nonbelievers." OK, he didn't specifically mention Paganism, or Shintoism, or Jainism, or Sikhism, or the traditional beliefs of particular Australian aborignal tribes, or lots of other specific faiths either. But I think that's more because it would be impossible to mention ALL possible faiths in every speech about the place of faith in American life. But there was nothing in his speech to suggest that non-Abrahamic faiths aren't every bit as much a legitimate part of American life as the Abrahamic faiths, and in fact, the speech specifically included non-Abrahamic faiths in the plurality of American religious experience. Yes, I get it, I'm a big ill-informed whiner. Everybody has bad days, even members of "rational" faiths. Sorry to stir up the dander. Everybody has had a "posting from emotion" day I'm sure, I was just unlucky enough to do it on someone else's blog. Mr. Philocrites, please feel free to delete my hasty comments from this thread. I'm taking your question as sincere, not as rhetorical sarcasm. You ask whether you should have respect for "uninformed criticism." But that's not what I said. I encouraged respecting "one another." It's possible to extend respect to a person whose opinions you don't like. I don't think ours is a "rational faith"--the phrase doesn't make sense to me, since faith requires a commitment to that which can't be proven (love, etc). I think ours is a covenantal faith which celebrates the use of reason as one of the modes of our walking together. In 1638, the early congregationalists in Dedham spent every Thursday evening for a year, week after week, talking with one another--listening, debating, testifying--to arrive at how they wanted to be as a church. Surely, they used reason. But a reasonable argument isn't one that uses facts as blunt objects, to disgrace the opponent. A reasonable argument focuses its venom on weak propositions, not the people who hold them. In fact, a reasonable argument extends love to the person holding the weak argument, since it seeks to win that person over. Our faith relies upon persuasion, not coercion; invitation, not intimidation. It says, "Here's what I hear you saying; here's how I see things." The successful argument, in my vision, will not leave one party victorious and the other disgraced. Instead, it will leave everyone enlightened, changed, and deepened in their commitments and in their solidarity. This is not pie-in-the-sky thinking, but it does mean abandoning the cheap thrill of point-scoring for the hard work of dialogue and loving relationship. Respectful relationship begins with listening and wondering. For instance, Jason's remarks aren't entirely "uninformed"--they're informed by his experience. I wonder what Jason's experience has been, that he would respond to Obama's speech as he did--it sounds like he's nursing wounds from the Midwest Social Forum. Later, it also sounds like he's self-aware in noticing that he posting from emotion. And I wonder what your experience has been, that you would respond to Jason's posts as you have. Maybe you're tired of lazy relativism, or of what seems to you like self-indulgent victim identitification. So, maybe your goal is to vanquish these things--which certainly sound like worthy goals to me. I don't question your goals, but your methods. As you seek to persuade others to agree with you, has your arguing style proven effective in the past? Have people been won over to your point of view, or have they just fallen silent? You obviously have a great talent for reason; I hope you will put it in the service of love. Obama's speech seems one example of how it's possible to disagree respectfully and rationally. Jake, sometimes honesty is a good thing, and it's quite respectful. For example, I take your careful worded (and wordy) homily to mean something close to "be nice, because you're a jerk." It's only the result of years of education you're able to pull that off. If you were, say, a wonderfully insightful but just barely high-school educated fellow from Southy would your post read this way? No, you'd get to the "you're a jerk, Richard" part a lot quicker (and not so deeply buried under social science mumbo-jumbo and university-acquired rhetorical skills). If all that makes you feel like you're less of jerk than I am, Jake, for your own bout of truth-telling, Good on ya! You're right, we're not a rational faith, just a faith of people so much better than others, going back centuries, it would seem. Thanks for the timely example. [W]e must entertain each other in brotherly affection; we must be willing to abridge ourselves of our superfluities for the supply of others' necessities; we must uphold a familiar commerce together in all meekness, gentleness, patience and liberality; we must delight in each other, make others' conditions our own, rejoice together, mourn together, labor and suffer together; always having before our eyes our commission and community in the work, our community as members of the same body. So shall we keep the unity of the spirit in the bond of peace. Though politicians these days still trot out that sermon (to support propositions that I think Winthrop would have opposed), they don't usually dwell on that particular portion of it. Obama, in contrast, didn't dig out the old quotations, but I think he was trying to make the same real point that Winthrop was. No, as a UU I don't feel at all excluded by Obama's failure to mention us. Rather, I feel implicitly included by his speech advocating inclusion, without feeling the need to be explicitly named. BTW, whatever the Dedham congregation did, it worked. It's in the next town over from mine, and it's still going strong today. Well fausto, there was also the law suit, er, "decision." Dear friends, let's be less snippy with each other. I'm glad to see you all engaging with each other, but it would make me terribly happy to know that you're all grateful for each other as dialogue partners. Oh yes, they had their little family squabble in the early 1800's, but hey, who didn't? Anyway, the half of the Dedham church that withdrew back then is still going strong as well, albeit under a new name (Allin Congregational Church, UCC), and of course in a new building with a new communion set. But that doesn't stop them from legitimately claiming the same descent from that 1638 congregation and its early community-building efforts that the (now-UU) First Church and Parish from which they withdrew also claims. You know, I love the UCC, but they can drive me crazy. Thanks for the reminder. "We worship the Trinity." Oh, they remember the decision. Check out, say, a Disciples, Methodist, or even a Catholic church website, and see how many have the word "Trinity" (look, Mom, we're not Unitarians) on the homepage (as opposed to buried somewhere else). What drives me even more crazy is how the UCC uses the "Trinity" as some sort of PC substitute for "Father, Son and Holy Spirit." One of the phrases is at least in the Bible. Senator Obama is going to break our hearts, simply because we projected so much onto him, that he somehow is going to help transcend all that which has held back progressives for decades now. How much have we projected onto him? Enough that a small failure to be completely inclusive in one formulation arouses sharp criticism. Enough that criticism of him reminds us of all the times in the past when progressives have trashed anyone who appeared to be an emerging leader over small points. He arouses a brittle protective defensiveness. He will break our hearts because we liberals have a need to idealize our leaders. There's a triangle between progressive activists, liberal politicians and the mainstream of our fellow citizens. The politicians are supposed to fix our relationship, or lack thereof, with the mainstream. They are supposed to faithfully represent us to middle America, so if they don't include something about us that is crucial to us, then it feels like a betrayal. Woe to Senator Obama if he becomes too successful -- then he will become a sell-out. He might also become ineffective, in which case, some slipup will mark him a fool. Dying young cuts straight to the heartbreak. Either way, that "skinny kid with a funny name" is going to break our hearts, unless we grow up. Thanks, Tom. Your wise observations helped clear my head. Tom's right: if we wrap up all our hopes into the person of Barack Obama, we're sunk. But it's important to discuss him, if only to learn from him. If we ascribe Obama's power to his biography or his charisma--neither of which can be borrowed--then all we can do is look on with anxious admiration, hoping he doesn't screw up. 1. Humility: his anecdote about his lame secularist response to Alan Keyes sets up what he has to say in terms of, "I've been there, but now I choose differently." 2. Authenticity: He tells his own faith story, in all its particularity; and he admits his struggle and his ambivalence. 3. Compassion: He names people's needs, when he says, "[People] want a sense of purpose, a narrative arc to their lives. They're looking to relieve a chronic loneliness..."
5. Commitment to Respect: again and again, he defies partisanship, extending respect to both sides; he names his own commitment to use "fair-minded words"
6. Vision: He concludes by naming his religious vision clearly and succinctly--"...that we can live with one another in a way that reconciles the beliefs of each with the good of all." The man has charisma, no doubt. But it's not only charisma. It's his well-honed rhetorical chops. If we're going to "grow up," as you say, I think we need to learn how we ourselves might communicate effectively, too. I was there on the 7th of July too. I thought it was funny how the grave Joseph Smith Jr. is hardly visited. I guess when apostates own the property, LDS church membership bard from visiting his grave.